← Is Canada A Terrorist State Hiding Behind The Illusion Of Being A Democratic Nation? Their costs would be too high politically at home. Their costs would be too high in terms of loss of Canadian, USA, or E.U. soldiers lives, because met with a force that is militarily equal to their own . Their costs would involve too much money going into the Ukraine crisis, without the possibility of enough money being made from clean up operations after the crisis and other types of war generated profits that make putting boots on the ground worth while and are a prerequisite to any serious meaningful military assistance from the USA, E.U. and now Canada. Canada should not be angry with the Russians, or the people of Crimean Peninsula especially since it is they that are at the very least partially responsible for the Russians being in Crimea in the first place. Canada the would be warrior nation’s Prime Minister Steven Harper bluffed and raised the ante with their rhetoric and empty threats and lost the Crimean Peninsula to a call and raise by Russia’s Vladimir Putin. The Russian president not impressed with all of the Canadian prime minister’s saber-rattling simply called Canada’s bluff and raised the pot with decisive action, putting Russian boots on the ground. Canada realising that the Russians were ready to call their bluff folded their hand and Ukraine was left alone to stand against the full power of Russia’s military. Inspiring revolutions and government overthrows has become an unfortunate part of the tools in the toolkit being most utilized to achieve destabilization in other countries and allow Canada’s, the E.U.’s and the USA’s not so secret, but not transparent agenda to democratise the world. Unfortunately the other nations of the world know that the E.U., USA and Canadian government must justify everything to its citizens and their citizens are tired of wars and the tolls they take on the economy, death of their children and their sense of morality and so saber-rattling is all they have to fear. The government of Canada, the USA and the member states of the European Union have learned very little, or even absolutely nothing about the negative hit to the economy and to the international reputation of warrior nations as a result of directly, or indirectly interfering in the affairs of sovereign nations government and its people. Some might consider how Canada treats its First Nations people reason enough to intervene and I think they would have a reasonable argument according to the reasons we have seen of late for such interventions by Canada into the internal conflicts between other sovereign nations and their citizens. At what point and how many international laws does Canada have to break before it would be deemed reasonable for the international community to apply sanctions, blockades, trade embargos and no fly zones to Canada for its mistreatment of its First Nations people and its absolute refusal to change? another thing that bothers me is Canada’s almost lust for violence, like Harper and Baird feel they need to start a war to prove themselves as a real warrior nation and not just a warrior nation on paper; this appears to be what Stephen Harper wishes his legacy to be and he knows his time to achieve it is quickly running out. The USA, Canada and the E.U. have been guilty of throwing their collective weight around in smaller countries, with little or no military capacity or economic ability to defend themselves against their combined military might, or ability to isolate them with sanctions, embargos and no fly zones, trying to force governments to adopt our way of governance and lifestyle. Canada unilaterally gives support to a protest that is supposed to be about showing opposition against what was an independent sovereign Ukrainian government’s trade decision and emboldens an underlying force with an agenda to topple the government and seize power for itself to act. Canada declares the overthrown government’s president a criminal and accepts the new government as legitimate and legal. Russia takes the cue from Canada and puts boots on the ground in Crimea and gets threats of sanctions from the E.U., Canada and the USA. Russia backs Crimean parliament and assists in a referendum vote that would see the Crimean people free of Ukraine and become part of Russia, Canada, E.U. and USA apply sanctions against Russians and officials and cease assets of wealthy Russians and Crimean supporters generating money for themselves, but little help for Ukraine now threatened with the real possibility of having to face a Russian invasion and the loss of their independence and sovereignty alone as the USA, the E.U. and Canada talk and profiteer. The Western Alliance has shifted its position over time from wanting the people of other countries to be able to vote for a change in the way they were governed and trying to achieve this outcome by diplomacy and reward, to actively and covertly promoting civil insurrection and violent over throws of legitimate governments. Canada, the USA along with the E.U. are guilty of having given money, arms and military training to overthrow legitimate governments and this is no more evident than in Ukraine. No matter whether you think that Canada was right or wrong in the roll they chose to play in Ukraine crisis, or the roll the Russians are playing out now is justified, neither side of the debate can deny. Canada’s unilateral action in Ukraine only served to exacerbate the already tense situation. Canada’s unilateral 1st man in, gung-ho, saber-rattling approach giving an excuse, if not a justified reason for the Russians to move on the Crimean Peninsula, which I believe it never really wanted to give up and has been looking for an excuse to get back ever since. If it is in the national interest and a vital security requirement of the USA, Canada and the E.U. to bring Afghanistan, the Middle East and Africa into the world of modern democracy, then surely one could argue that Russia might feel that they are being pushed too far concerning their security needs and requirements when democracy in the form of monetary aid, comes interfering in their backyard in the Black Sea region of the world, encouraging the over throw of a government that was trade friendly to them and sought to continue to do so instead of adopting an E.U. that seems all the rage and a must have in the west. That the communist countries of the world like China and Russia up to now have been amazingly quiet and patiently doing little as the USA, Canada and the E.U. emboldened by the in action and lack of retaliation of the communist heavy weights have pushed aggressively to change the world into a mirror image of themselves. Every one with half of a brain had to be wondering how where and when would the push back come from either China, or Russia and now we know. Canada’s interference in what Russia feels is vital neutral military zone and is integral to its security in the region was the straw that broke the proverbial camel’s back and shattered the fragile balance of negotiated security and peace. 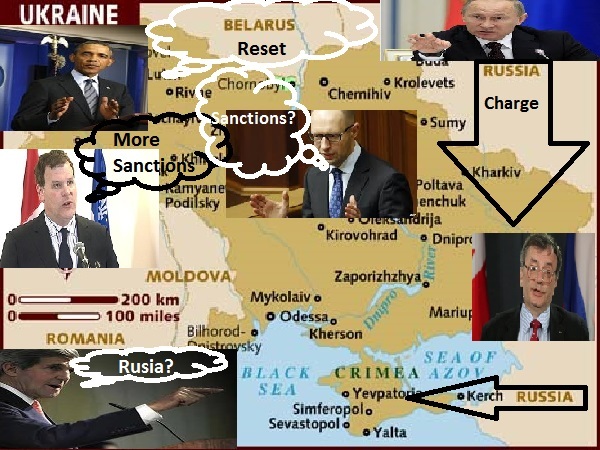 Neither the threat of military force, or sanctions will prevent Russia from keeping the Crimean Peninsula if it chooses to do so and further more neither will they keep the Russian’s from taking the rest of the Ukraine if they so choose. Which country is willing to commit it self to what could possibly and has the potential to escalate into a nuclear war over the Crimean Peninsula, Ukraine, Poland, Czechoslovakia? I ask only because when it last happened no one from the USA, Canada, or the E.U. came to these people’s aid. We had what we called a cold war, but I would say that it di precious little for those who were taken into the Soviet Union against there will and may have caused their suffering to increase as food, medicine, knowledge from the outside world was cut off and freedom of movement got next to impossible. That 95% of the Crimean’s that voted have cast their ballots in favor of becoming part of Russia may not be what the USA, Canada and the E.U. wanted, but never the less it cannot be ignored at least there was a vote. Unlike the overthrow of the legitimate government of Ukraine and the acceptance of the illegitimate non elected interim government of Ukraine that the USA, Canada and the E.U. 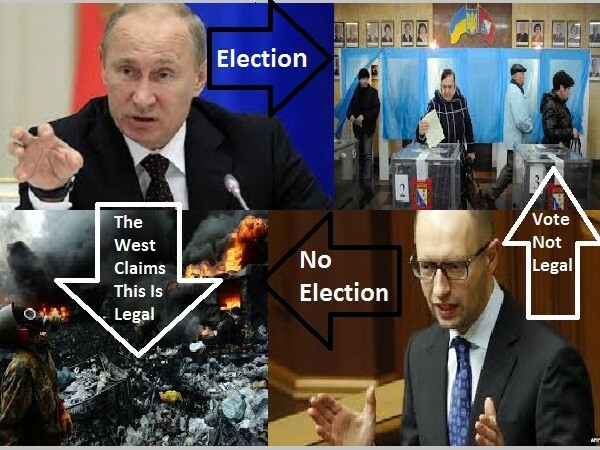 has endorsed as legal and justified the people of Crimea were given the choice. What I am getting at is that no nation is above international law, the only thing that validates international laws is our own ability and willingness to follow them ourselves. If we keep switching international laws to suit individual countries, or certain groups of countries and their needs, aspirations and ideologies then in time we are back to every man for himself and the chaos that arises from it. Democracy like peace is just another word when not backed up with actions that say to all by example that this is what we mean and this is how we live our lives. The west must also realise that other nations such as Russia are not stupid and as such are able to see that we are marching through the world much as we did in crusades trying to bring the world to our version of religion, means of governance and culture, calling everything else encountered uncivilised, immoral and illegal and the Western Alliance’s duty to change. This way of thinking followed up by actions is rightfully seen by others as empire building. It is unrealistic to think that others in the world are going to allow themselves to be forced into a western made new world order, which amounts to western ideology, political governance, culture and religion are dominant. I think countries like the USA, Canada and the member states of the European Union have been bullying and poking countries like Russia and other non democratic countries for a long time now, so much so that Russia has finally said no more and pushed them back. This entry was posted in abuse of power, Canada, Government, Uncategorized and tagged Canada, Crimean crisis, Crimean referendum, Government of Canada, John Baird, politics, Russia, United States, Valdimir Putin, Warfare and Conflict. Bookmark the permalink.